Pilgrim George wanted to become a priest, but his heart was empty. He took a leave of absence to pray and seek the Lord. He joined a group of hippies feeding the homeless in Los Angeles, then a group of doomsayers in Colorado. The group was waiting for the end of the world, but it did not happen, and the group split up. He went up to the mountains to be alone. It was in solitude, he said, that he really “came to know the Father’s love” and felt called to go on a pilgrimage. So in 1970, he took a freighter out of New Orleans, sailed to Spain, and journeyed, mostly by foot, to Jerusalem to retrace the steps of Jesus. He was 29. Pilgrim George went on the road to meet the churched and the unchurched. He prays and sings as he walks, and makes eye contact with passers-by. 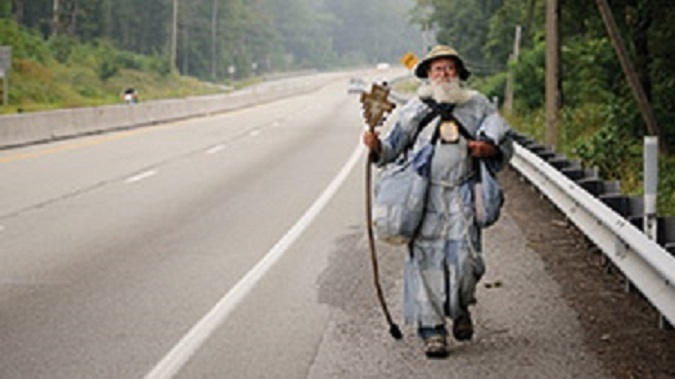 Some people along the way give him food, water or alms, and occasionally, a short ride or a place to sleep. “It doesn’t matter what way of life God calls you to — married, single, priest, layperson, it’s what’s in your heart that matters. Spirituality is something that anyone can seek, no matter where they are.” Pilgrim George said. Here is the full story of Pilgrim George. This entry was posted in Uncategorized and tagged Faith, inspiration, Pictures, Pilgrims, postaday, Religion and Spirituality, Sunday Snippet by Perpetua. Bookmark the permalink. Great post! Absolutely – follow your heart and you will find spirituality wherever you are, and you will know the right path. Thank you Monty, you are so wise to say that. Exactly what your post is always about, you calling… to be a mother of nine9 and then some. God makes Himself accessible to all and as St. Thomas Aquinas wrote, “Grace builds on nature.” Pilgrim George is a great example of this. Thanks for this post. Pilgrim George became a better person by listening to God and he received so many Graces from Him. Thank you Barbara. Love this story, too, Ms. g.
It’s worth sharing. You are welcome. I have to admit, I do enjoy working on the blog. I lke the reference to ‘his heart was empty’ – what love he is filled with now!! Isn’t he’s amazing to find happiness along the way to fill his heart with love. You are welcome, Lucy.